Nike SB Blazer "Low End Theory"
Sneaker fiends have had their eyes on this release for months. 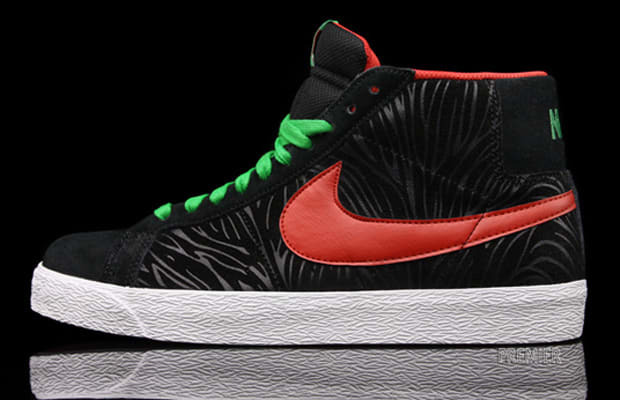 The Nike SB Blazer "Low End Theory" — or the "Tribe Blazers" as their being called — draw inspiration from A Tribe Called Quest&apos;s Low End Theory album cover. The all black suede upper feature a graphic similar to the one on the Tribe&apos;s cover as well as the same color scheme of red and green. These quickstrikes are now available at select Nike retailers like Premier.